Introduce your 1st graders to the concept of diagraphs. Each of the words in this worksheet is lacking a diagraph. In order to make sense, kids need to add either sh, ch, or th to each word. To help kids further, a picture of the correct word is provided alongside. 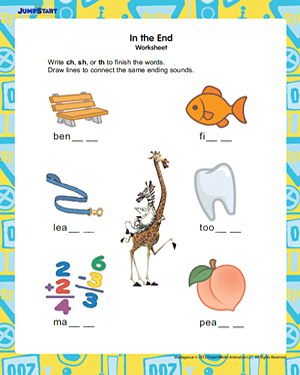 Once all the words are complete, encourage your 1st graders to draw lines to connect the same sounding words.